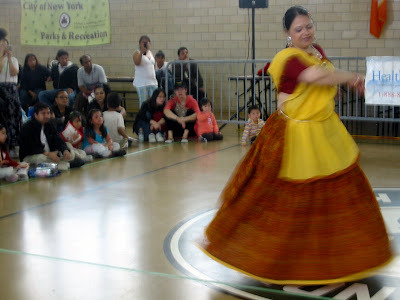 Saturday's Diversity Celebration, sponsored by Young Dancers in Repertory, Friends of Sunset Park, and the Sunset Park Recreation Center, was a success despite the exceptional weather that kept many families from attending. 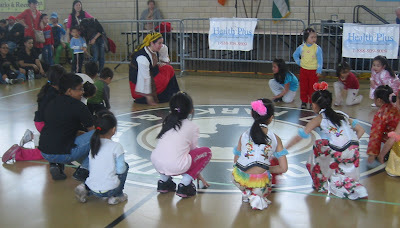 The various dances represented many of the cultures found today in Sunset Park. 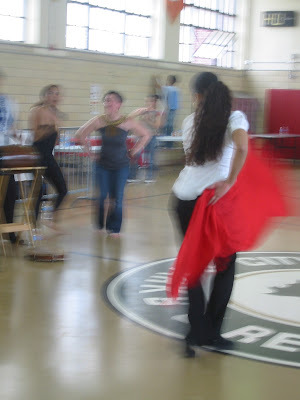 In addition to the dancing, informational booths were set-up to assist residents with dental health (Methodist Hospital's Pediatric Dental Clinic), HIV-AIDS education (Brooklyn AIDS task force), Fire Safety information, Immigration and New Arrival issues (New American Welcome Center/NYC Immigration Coalition), and other representatives from elected officials. There was also a strong showing from United Senior Citizens of Sunset Park. Below, please excuse the poor quality of the photos. I know not to face the windows, but it was that or stand on top of the dozens of children watching from the side. I think they are just about in order of performance. I didn't get photos from the Polish Folklore Dance Troupe or the Quetzalcoatl group, so if anyone has them, please share! 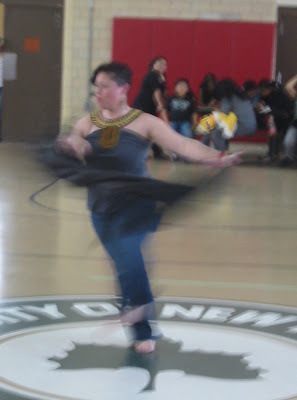 From the Redhawk Native American Arts Council, we had some hula. She was lovely, and tried to teach a very shy-of-the-spotlight group a few moves. 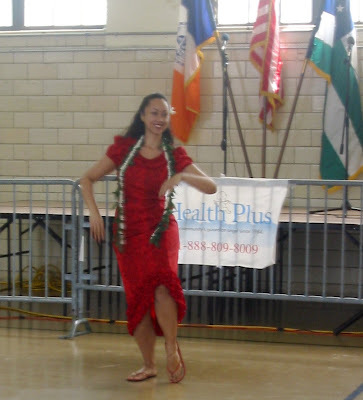 She performed a traditional Hula as well as a more Hollywood "sophisticated" Hula. In the first of her many dances, Alexandra Bayeva performed a Russian dance which delighted the on-lookers with its fast beats. 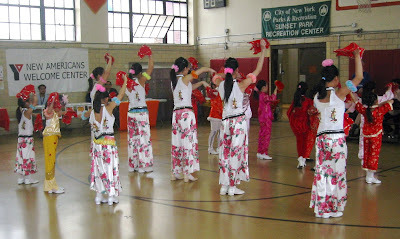 The Chinese Planning Council had several dances with children and young adults. This was the first, and all the parents took out video recorders to get their kids on tape. It was very sweet. Again, Alexandra Bayeva performed. This second dance was a Ukrainian dance with lots of spinning and twirling. 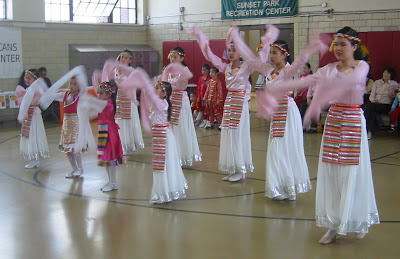 A second dance by the Chinese Children's troup. They managed to synchronize, even with the littlest ones. This was from a traditional Indian dance performed by a very energetic (and persistent) woman who really tried to get some adults to dance. 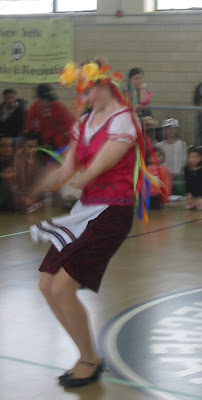 She performed two different styles of Indian dances. She also taught a few moves to the participants. 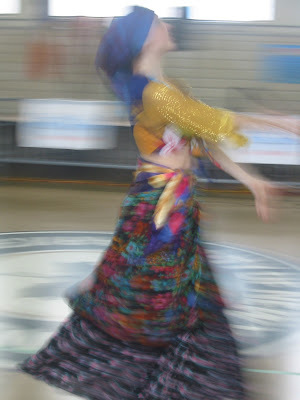 The third performance by Alexandra Bayeva was a Gypsy dance. It was interesting to me because it was so different from the Gypsy dancing in Spain - none of the stomping and Flamenco style arm movements. It was more fluid and joyful rather than angry and sexual. This is when I had to leave for a while. I missed the Polish and Mexican dances. I may have missed something else as well, so if anyone else attended and took photos, please add them to the Best View in Brooklyn photo pool! 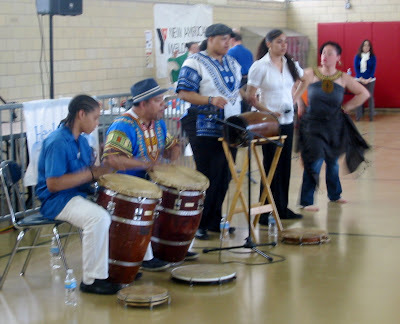 The final group was BombaYo, a Puerto Rican BOMBA group that brought its own drums and instruments. I met these guys on their way up the hill to the Rec Center; they were incredibly friendly and warm. Their music and dancing reflected that attitude. You can see a youtube video at the link above. This woman danced to the audience and the drummers with her scarf. She was incredibly energetic and serious as a dancer. This young lady also used a red scarf as a prop. All three dancers were lots of fun, and the audience loved it. A couple of people joined in to the performance as well. Hopefully next year's celebration will have overcast, cool, damp weather so that more people can enjoy the dancers and getting to know their neighbors a bit more. Thank you to the people who worked so hard to put the event together! 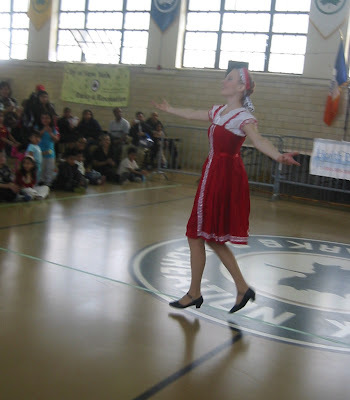 Labels: dancing, Friends of Sunset Park, Sunset Park Recreation Center, young dancers in repertory.